Sometimes you want to create an instance of class that is related to a family of classes without specifying the exact concert class. Factory design pattern came to solve this issue and make it easy for us. In order to avoid duplicating the code that make the decision everywhere an instance is created, we need a mechanism for creating instances of related classes without necessarily knowing which will be instantiated. Simple Factory: the result of the Factory method is a subclass (inherited class) of the Abstract Class. The choice of which subclass to instantiate is completely defined by which method is used, and is unknown to the client. Abstract Factory: an abstract class defining a common protocol of Factory methods. Concrete subclasses of the abstract factory implement this protocol to answer instances of the appropriate suite of classes. Suppose we have 2 Audio/Video devices (CD & DVD ). Both devices has audio and video features but those devices does not have the same shared parent class. And we need to simplify the creational of objects. The best solution for this is to go with abstract factory design pattern. Below is the diagram illustrating how we can design classes to serve the main purpose. IVideoDevice: is the interface that all Video classes inherits. IAudioDevice: is the interface that all Audio classes inherits. IAudioVideoDevice: is the interface that all Audio/Video classes inherits. CDAudio: Inherits from IAudioDevice and implement the needed methods. 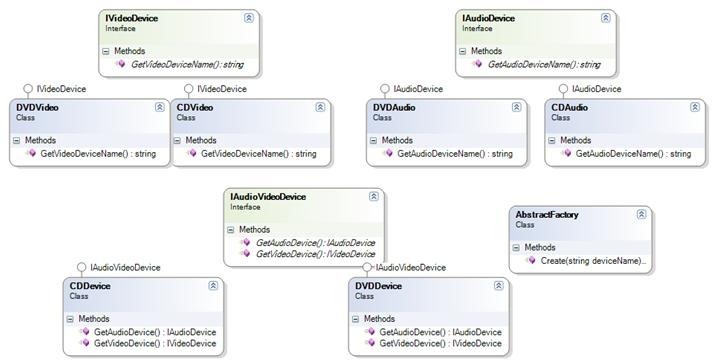 CDVideo: Inherits from IVideoDevice and implement the needed methods. 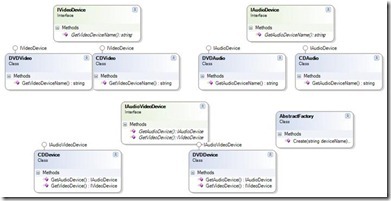 CDDevice: Inherits from IAudioVideoDevice and create the correct Audio/Video devices. DVDAuio: Inherits from IAudioDevice and implement the needed methods. DVDVideo: Inherits from IVideoDevice and implement the needed methods. DVDDevice: Inherits from IAudioVideoDevice and create the correct Audio/Video devices.